Now Northwich is a new one-day, large scale international street theatre festival heading to Northwich on 6 October. High-quality street performers from across the world will be performing alongside our local professional company’s Cheshire Dance and Fallen Angels Dance Theatre, who have been leading a community programme that will see more than 100 local performers taking part. Councillor Louise Gittins, Cabinet Member Communities and Wellbeing said: “This is going to be such an exciting event for Northwich. The Urban Astronaut, Vegetable Nannies and Push are just some of the many performers already confirmed. Saurus is set to light up the town for the finale. Now Northwich has been developed with Deda Producing, who are renowned for producing outdoor festivals, in partnership with Cheshire Dance, specialist dance agency. The project has received much support from local partners including Northwich BID, Northwich Town Council, Mid-Cheshire Development Board, Gadbrook Park BID, Marketing Cheshire and independent traders in Northwich. 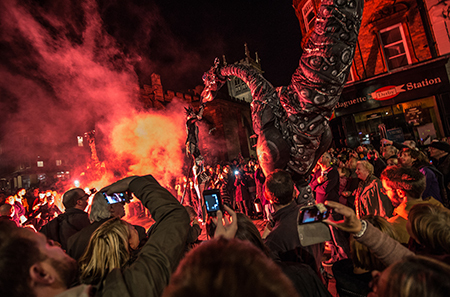 Funded by Arts Council England and Cheshire West and Chester Council, the festival is a feature event part of SLANT.